In the days of covered wagons and wide open ranges, an old farmer riding his horse over the prairie discovered a newborn bison calf next to its mother that had died giving birth. He took the calf home and raised it with his pigs. The farmer’s neighbors used to come by and watch the young calf as it played with the pigs and rooted around in the dirt. As it grew it became a real sight, this huge bison bull weighing nearly a ton wallowing in the mud with the pigs, content to eat from the same trough and live within the confines of the sty in which he wasted away his hours and days. Until... One day as he stood above the water hole from which he drank, something caught his eye high on a hill that overlooked the pen in which the bull had spent its entire life. In the distance the bull caught a glimpse of movement, a cloud of dust, and rumbling like thunder. With newfound intensity, he beheld the sight of a herd of bison running. They were magnificent creatures. Noble. Strong. Free. Cool wind rushed in and stirred the water before him and he gazed at the image that began to emerge as the ripples quieted. As if for the first time he realized the image reflected was his own. Staring back at him was the very image of those magnificent, noble and free creatures he had seen on the hill. 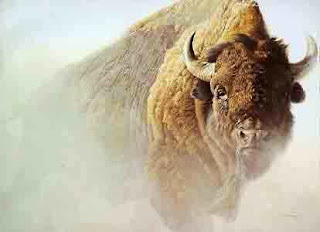 Looking back at the herd of bison on the hill high above his sty, his spirit stirred within him and for the first time he knew and understood. He was a bison. The bull began to stomp and claw at the ground. His muscles quivered with excitement. His breathing became deep and measured. His nostrils flared, and he shook his massive frame free of the dust and filth and the stuff of his past, then suddenly leapt forward ran at a speed he had never before believed possible. He easily cleared the hobbled fence of thin-stranded wire strung between short wood posts—nothing more than sticks really—that had restricted his movements his entire life. Free at last, he comprehended who he really was and realized he was meant for a life of nobility, of strength, of freedom. Too many of us are content to wallow with the pigs when we were created to live a life of nobility. Too many of us have not yet fully understood who we really are, not yet realized our full potential. We have not yet fully comprehended that we were created in the image of God, created for a life of freedom and fellowship with the King of Kings and Lord of Lords. Take another look at the reflection in your mirror, then gaze back across history at the cross of Christ. Take another look at Christ. Noble. Regal. Royalty. Realize that you are made in His image, designed, created, and intended for a life of nobility. “But you are a chosen generation, a royal priesthood, a holy nation, His own special people, that you may proclaim the praises of Him who called you out of darkness into His marvelous light” (1 Peter 2.9–10). As followers of Christ we are to help others see themselves through the eyes of Christ and help them realize who they are in Christ. Like the story of the farmer’s bison, we are called to inspire others to break out of their sty and begin living the life for which they were designed, created, and intended. We are privileged to share with others that they are better than that for which they’ve settled, that they were created and meant for greater purposes. May we be faithful to help others get out of the mud, away from the swine, and be free from the hobbles that restrain them. As God’s redeemed, we are called to proclaim the praises of Him who called us out of darkness into His marvelous light.